JANUARY 14, 2017. History birthday remembrance….of good going bad…. Mamas, don’t let your babies grow up to be…..traitors. Hannah Waterman King Arnold had desperately wanted children as lost two infants while married to Captain King and lost an Arnold son prior to the birth of Benedict Arnold V on January 14, 1741. She was a wealthy, very pious, widow; new husband, Bendict IV, was enterprising and ambitious. Life as the eldest son in a prosperous family in an expanding British Empire bordered on stimulating excitement most of his childhood. Outgoing and athletic Benedict Arnold loved the adventure and boyhood challenges, enjoying show-off danger with male bravado. All of this was wonderful until his father’s business success climatically failed and he became a hopeless alcoholic. In their hometown of Norwich, Connecticut, a city consumed with religious conflict, much of the father’s shame fell upon young Benedict. This financial and emotional reversal may have started a painful psychological need that lasted into his adulthood as it played a huge role in the patriot reversal of adult American General Benedict Arnold in 1780. General Arnold still had the show-off male bravado throughout his Revolutionary War service. Commander of the Continental Army, George Washington, deeply believed in Arnold and Arnold did not disappoint in his superior leadership and bravery. Washington and Arnold were considered America’s greatest warriors. Arnold’s primary military successes were as captor of Fort Ticonderoga and victor at the battle of Saratoga. He was severely wounded in mortar fire, refused to have his leg amputated as demanded, and limped the remainder of his life. Men such as this often acquire enemies, even within their own folds. Washington, too, had his own American jealous and ambitious enemies throughout the Revolutionary War. Two similar men…brave, strong, leaders. What happened? Where did character and honor separate them? Right and wrong had no relevance for Arnold. It was everything to Washington. Author David R. Palmer described Arnold as having a historical record replete with evidence to indict him as a thoroughgoing narcissist, ego-centered in the extreme. Today’s politicians often refer to ‘right values’….but what exactly ARE they in a divided society. The America of the 1770s was a divided society, just as America is divided today. Then it was the colonists vs the loyalists. Today it is the political parties and their corresponding agendas. Congress was not kind to either Washington or Arnold during their army service. Arnold became very angry at not being recognized enough as a hero, having to fight for his military money owed him, being ignored and overlooked for promotion much deserved. Added to this, he had a new beautiful young second wife who had been spoiled and used to luxury…. and wanted it to continue. Arnold did not want to repeat his father’s shame and his ego overtook whatever patriotic and true character he had. There was enough history for Washington to trust Arnold, and he did. West Point was a major American fort that would be an excellent win and location for the British. Arnold, unable to go into battle because of his serious leg situation, purposely convinced Washington to give him control—with his already-in-the-works plan to turn it over to the enemy, British General Henry Clinton. 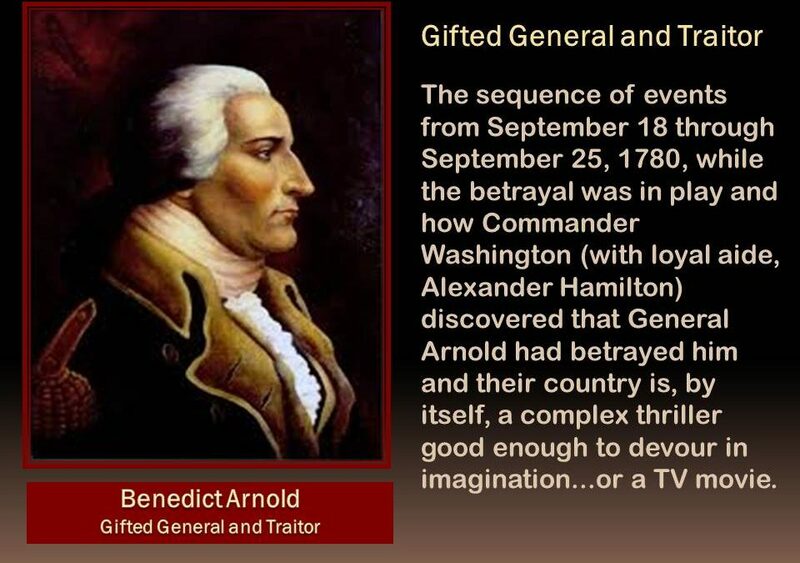 The sequence of events from September 18 through September 25, 1780, while the betrayal was in play and how Commander Washington (with loyal aide, Alexander Hamilton) discovered that General Arnold had betrayed him and their country is, by itself, a complex thriller good enough to devour in imagination…or a TV movie. The slow-moving by messengers, the Arnold escape, the capture of spy John Andre (later hanged when the British wouldn’t ‘trade’ for Arnold), the dramatic screaming and scheming of Peggy Arnold claiming innocence (she wasn’t) are all human-nature stories that can still be compared today. The populace had been downhearted and discouraged about the progress of the Americans in this on-going-against-all-odds, difficult war (today our war against Progressivism). Benedict Arnold, ironically, gave revitalization to our Revolution much the same as Barack Obama has given revitalization to our Republic today. Rescue from villainous perfidy (two-faced, treacherous, traitorous, faithless, disloyal)? REVITALIZE…..and take care of those babies….teach them character, patriotism, our founding, and our Founding Fathers….with love and respect for America. ~~~~Many books to recommend on Washington and the Revolutionary War, which, of course, also include Benedict Arnold references. Much of what is written here is from GEORGE WASHINGTON AND BENEDICT ARNOLD….A TALE OF TWO PATRIOTS by Dave R. Palmer, Former Superintendent of West Point (copyright 2006). 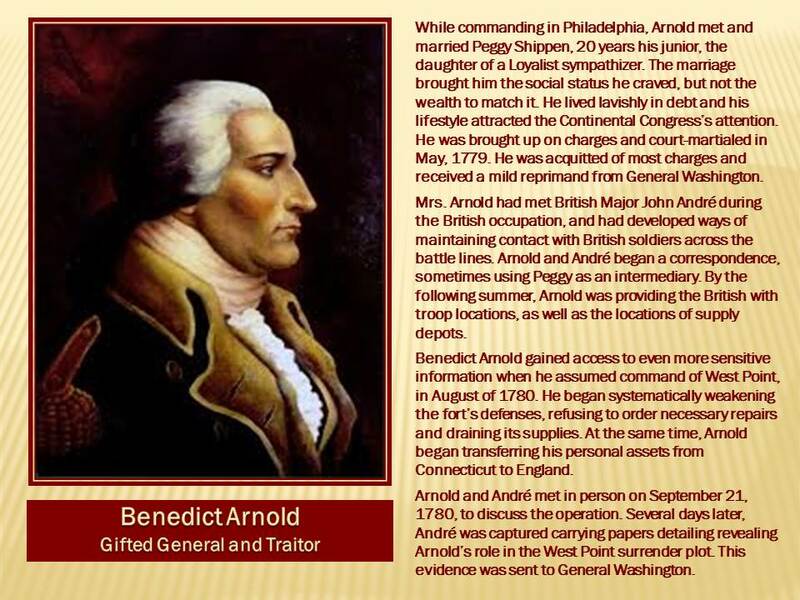 Another only on Arnold is a young person’s book, TRAITOR: THE CASE OF BENEDICT ARNOLD by Jean Fritz (copyright 1981).